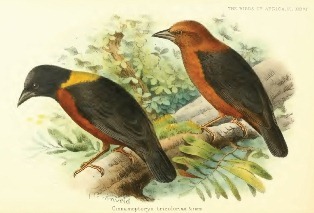 The Yellow-mantled Weaver was formally described by Karel Johan Gustav Hartlaub, a German physician and ornithologist, but this species had been described previously. The Yellow-mantled Weaver was first described by George Robert Gray, an English zoologist, author, and head of the ornithological section of the British Museum. Gray started at the British Museum as Assistant Keeper of the Zoology Branch in 1831, when he would have found the specimen brought to the museum years earlier. 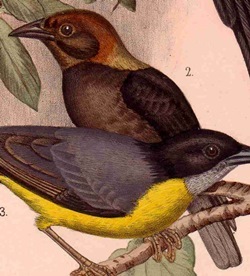 Gray named the bird "Ploceus collaris" but this name had been used for the Village Weaver (now a subspecies), making the name invalid for the Yellow-mantled Weaver. The first person to realise this problem was Hartlaub, who renamed the specimen to its current name. The Yellow-mantled Weaver had been collected by Captain Edward Sabine, an Irish astronomer, geophysicist, ornithologist, explorer, and soldier. Sabine travelled halfway around the world to study the the "oblateness" (shape) of the Earth and carried out measurements on the intertropical coasts of Africa and the Americas. Sabine had struck up a friendship with Douglas Clavering, an officer of the British Royal Navy, who agreed to take Sabine on board the Pheasant. They travelled to Sierra Leone, the Island of St Thomas, Ascension Island, Bahia, Maranham, Trinidad, Jamaica, and New York during the years 1821-23. Sabine obtained the Yellow-mantled Weaver specimen while in Sierra Leone. The first illustration of a Yellow-mantled Weaver is by Reichenow (1902). The next illustration was published by Shelley (1905), including a juvenile. Reichenbach (1863) mentioned the species, and provided an English name (not the first English name, for once! ), but did not illustrate it. Hyphantornis tricolor	Hartlaub 1854	Journ. f. Orn., 2, p.110	Sierra Leone. tricolor - Late Latin. tricolor, tricoloured, of three colours. Yellow-collared Weaver, The tricoloured Weawer, Uganda Yellow-mantled Weaver. The type specimen is in the British Museum (Old Vellum Cat. 21 no. 81a).